When our daughters were little, they always wanted to hear a bedNIGHT story. Of course, they meant a bedTIME story but I dared not correct them. It was one of their charming childhood malapropisms. Chris and I would tell them stories until they entered the magic of their dreams. Whatever you call it — Oh. So. Good. I was bummed when it closed on Broadway. More than a few of my friends told me that I’d like it. But it’s not always easy for me to get to see everything I want in New York City. Though God knows, I try. Once in a while, I get a reprieve. While it closed on Broadway in January, it reopened a few blocks away in at New World Stages with much of the same cast and in the same amazing production. I don’t know how to summarize the show’s many themes — It is about how to grow up; how children are wiser than adults; how believing in one another is never wrong; how music and comedy make magic; how letting go is part of what you do when you love. 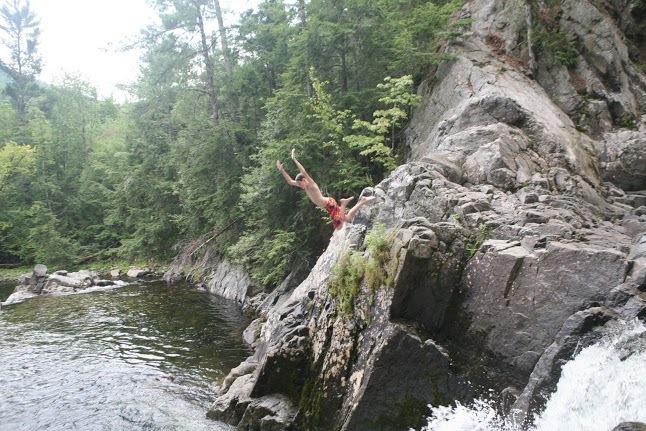 Children can fly (one of my darlings at the swimming hole in the Adirondacks). My favorite recurring theme was taught by the girl Molly. Here is her secret to good leadership: a leader looks out for her tribe. Molly taught this to the boy who became Peter. Molly, played by Nicole Lowrance, is the only girl in the show. She’s so good. Molly has to be sister, friend, love interest, and, of course, mother to the orphan boys. But she is not the kind of mother or leader who scolds needlessly, (although she does scold). She is the kind of mother who finds magic in stories. She’s the kind of mother who soothes scared nerves by suggesting a running race. Molly’s a playful leader. I found a new heroine and her name is Molly! Molly is the starcatcher. It’s a physical show where the leads play doors and walls and mermen. The words are witty and the physical shenanigans are hilarious. At one point I was laughing so hard I was crying. And then at another point, I noticed that Chris was weeping. I think his tears came from the place of nostalgia for we miss the nights when our darlings were still little enough to climb on our laps and beg for one more bednight story. Ah well. We can always take them to see this show. And even if you’re not in NYC, you can see it too, as it’s touring this year, starting in August 2013. The show is at New World Stages, 340 West 50th. Girls can be pirates too. Empowering girls. Diane’s post and a backstage tour! Thanks to CultureMomMedia.com for the tickets. All thoughts (and memories of bednight stories) are my own.